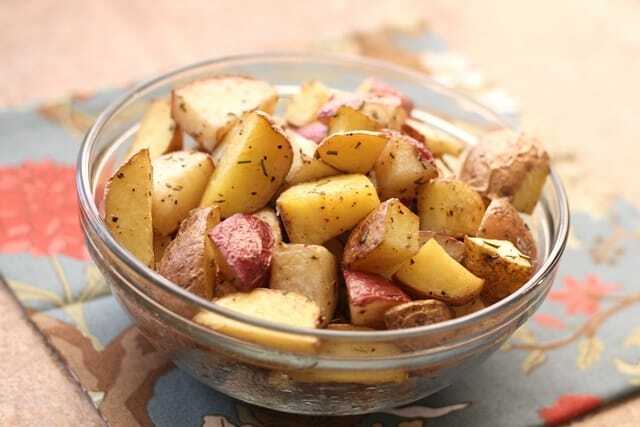 Crisp roasted potatoes with a fluffy center are one of my favorite side dishes. I serve them for breakfast, lunch or dinner and I usually double or triple the recipe to keep them in the refrigerator during the week for easy breakfasts. Tossing the potatoes with fresh rosemary makes them just a little bit fancier without any real effort or extra time spent. I served these potatoes with Pan Fried Chicken and Caramelized Brussels Spouts. There was hardly a bite leftover after the meal. Preheat the oven to 425 degrees. 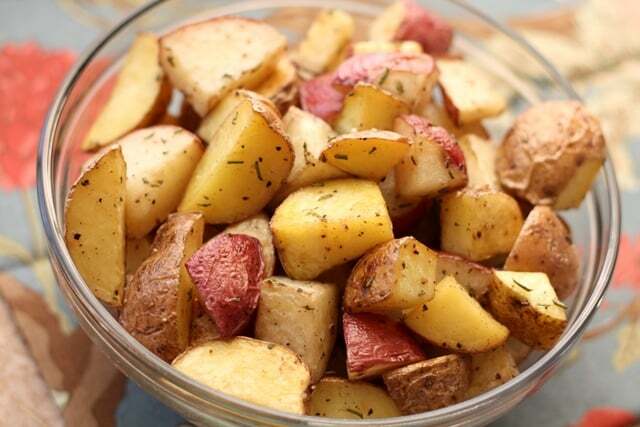 Chop the potatoes into bite size pieces and place in a large bowl. Drizzle with olive oil and toss with your hands to coat thoroughly. Sprinkle generously with salt, pepper and rosemary. Toss again to distribute the spices over all the pieces. Spread the potatoes across a well oiled or silpat lined baking sheet. Roast for 35-40 minutes, stirring the potatoes and turning them over with a large spatula at last once halfway through. 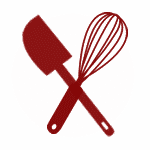 Potatoes are done when they are fork tender, lightly browned and slightly crisp. Enjoy! For a second I was wondering why Jenn and Larry were talking about me before I realized they were talking about HER Chris;) These potatoes are roasted perfectly, I love them like this. 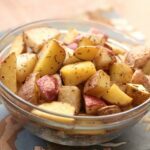 I add coarse mustard to the mix...try it, it turns simple rosemary roasted potatoes into amazing rosemary roasted potatoes! Had those last night for dinner, but they were mixed with rosemary chicken! Yummy!